As such, the 1.392 mb/d figure for May, bad as it is, is woefully out of date. Sources told Argus Media that production plunged to just 1.1-1.2 mb/d in early June, heading down towards 1 mb/d. “Eastern division land-based storage of 11mn bl is at full capacity, and western division storage capacity of almost 48mn bl will be filled to its operational capacity in a question of days,” the western division executive told Argus. PDVSA’s terminals and facilities, equipped to handle 61 million barrels are “filled nearly to capacity,” an oil ministry official said. The storage and exporting problem is having a ripple effect upstream. PDVSA and its partners have halted operations at two upgraders that process heavy oil, and two more facilities could be shutdown, according to Reuters, moves intended to ease the pressure on the storage facilities. But if upgraders are shut down, PDVSA won’t be able to process heavy oil, which means it will have to curtail or shut down operations at its oil fields. Analysts have predicted that Venezuela’s oil situation would deteriorate over the course of 2018, but the descent is happening much faster than most people predicted. If OPEC said Venezuela produced 1.392 mb/d in May, and sources from within the Venezuelan oil ministry are now saying the country is producing between 1.1 and 1.2 mb/d, that could potentially mean output falls by a few hundred thousand barrels per day in June compared to a month earlier. Venezuela had been losing roughly 50,000 bpd each month this year, so the unraveling underway right now is a sign that production losses are spiraling out of control. In another sign of trouble, PDVSA announced that it will suspend oil shipments to about half of the Caribbean nations in the Petrocaribe program, according to the Antigua Observer. The program, inaugurated under the late Hugo Chavez, offered Caribbean nations oil and refined products on favorable terms, often including extended payback periods at extremely low interest rates. 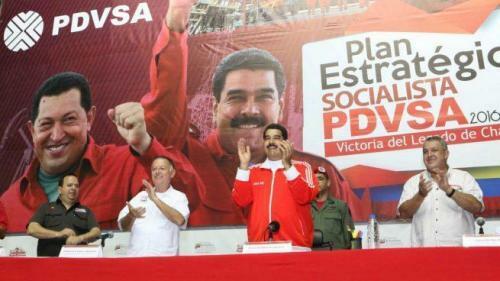 PDVSA said it would cut shipments of refined products by about 38,000 bpd to eight of the 17 countries in the program. Amazingly, PDVSA has vowed to keep up some 45,000 bpd of shipments to the other nations. Meanwhile, PDVSA apparently does not have enough of the type of oil that it typically sends to Cuba, so, despite being essentially broke, it is reportedly trying to purchase light crude from third parties to send to Cuba in order not to disrupt shipments to its ally. It is hard to see things turning around anytime soon. 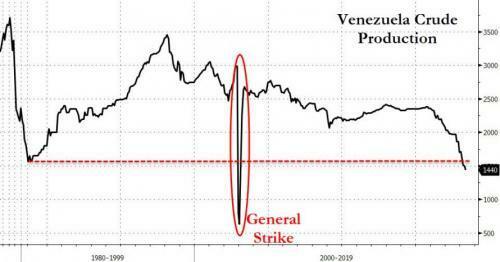 “For Venezuela, we assume no respite in the production collapse that has taken 1 mb/d off the market in the past two years,” the IEA said on Wednesday.